June was a great month for me! 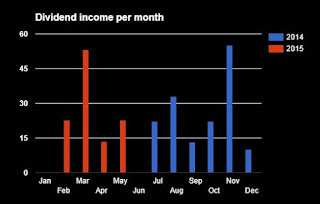 In order to achieve the annual $300 of net dividends, I should have received $150 by now. The total net dividends of 2015 are currently at $141.01, so I'm a little bit behind, but I think it will work out just fine! Being behind schedule gives me motivation to research new investment opportunities! Exactly 1 year ago, TGT was in big problems. 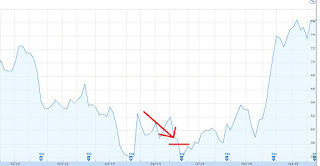 The stock has had a huge downfall due to several problems. This gave me a very appealing entry point, as marked at the graph below. After that, things have gone very well for TGT. The stock value has risen from $58 to over $80 now. 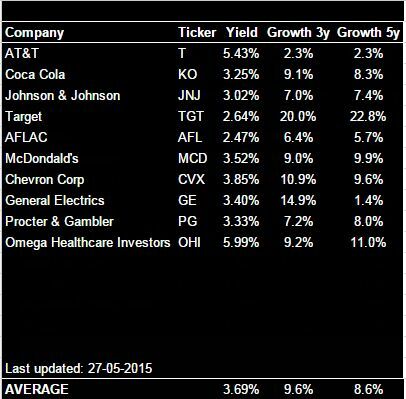 This makes TGT by far my best performing stock. Current price is +38%. Of course I'm keeping this winner! The 7.69% dividend increase they announced recently, is just another example why this is a great stock to have. TGT raised their annual dividend from $2.08 to $2.24. Getting into July next month will be very exciting for me. Last year in July, my first dividends ever, were deposited into my account. 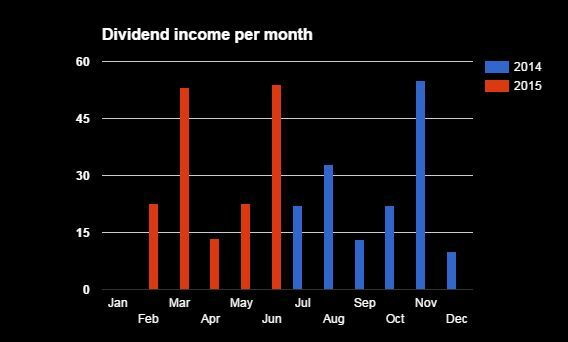 This means I'm able to start comparing dividend results to last year, which is something I have been looking forward to. 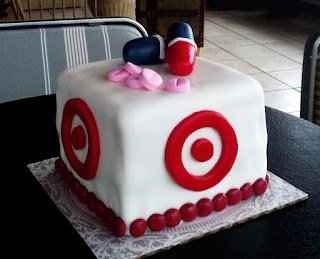 Today, we celebrate my very first blogiversary! Right from the start, I felt a very warm welcome from the entire community. This helped me a lot. Not only because of the solid advices you all provide, but also through the content so many of you create. Please take a piece of this beautiful cake. Some of you might recognize a logo in that. This is not a coincidence. Looking back, Target (TGT) has been my best holding, by far. Before we get into that, let's see what the relative new blog has brought me, in the past 12 months. 31 posts were published, roughly 3 per month. These posts were complemented by 160 comments! That's much more than I would have anticipated. Thank you all very much for the participation. It's much appreciated. The blog has been visited 11.476 times. Wow! The vast majority of visitors is an American. Not uncommon for an English blog about US Dividend Aristocrats I would say. I couldn't thank all of you personally, but I do like to mention Dividend Yield, because of his continued support through Twitter, as well as Captain Dividend for adding me to the blogroll of his very succesful blog. This adventure started by purchasing 4 major Dividend Aristocrats for a total of $6.666. After these purchases I added money to my brokerage account on a monthly basis. 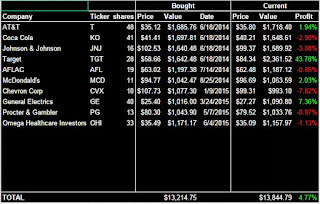 This resulted in a portfolio, which has 10 holdings, with a cost basis of $13.214. 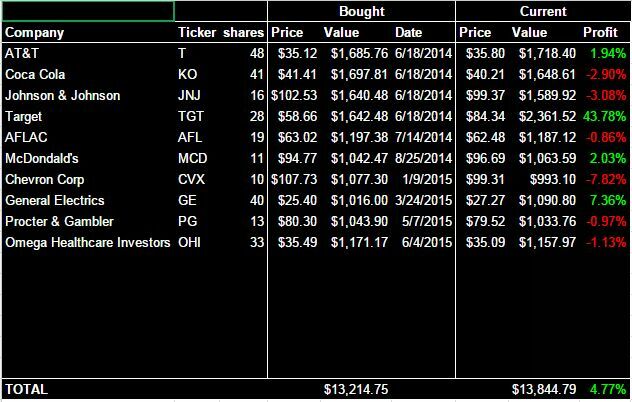 Today, the value of this portfolio is at $13.844. This is a 4.76% increase. Dividends are excluded from this. 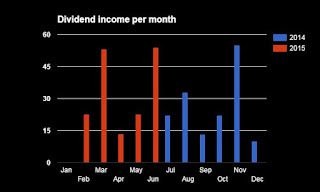 Should we add the $264.80 net dividends received (June 2014 to June 2015), the total return is a decent 6.77%. Overall, I'm very pleased with the results. The price fluctuation don't worry me at all. It might provide me with a chance to average down in the future. Main reason for starting this adventure is because of disappointing interest rates banks give us nowadays. Most major banks in The Netherlands decreased the interest rate to approxiamately 0.9%. At least for the last 12 months, this DGI strategy has paid me 7.5 times as much! 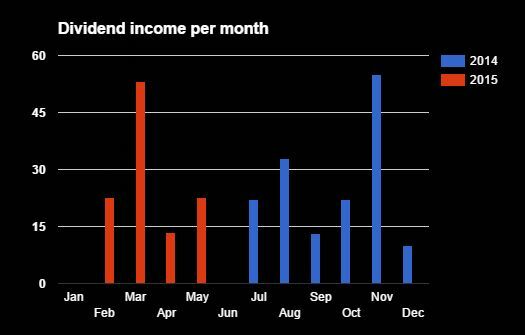 Even if we would ignore growth, just the dividends paid me more than the bank would have paid me in interest. Isn't that amazing? To start the snowball effect as soon as possible, I tried to buy some high yielding, blue chip stocks. Most high yielding companies, don't have very strong growth numbers. This is indicated by the table below. From this point forward I will shift my focus to growth. Of course, yield remains important as well, but I feel like my average growth should be a double digit number. I'm exploring the posibilities to get into p2p lending. This should be a nice addition to the passive income stream. At this point, I'm not sure if I would have enough funds to do this efficiently, because I don't want to cut the amount I put in my brokerage account each months. The snowball has to grow! After all this good news, I'd like to share some concerns as well. First, there is this Euro vs Dollar issue. 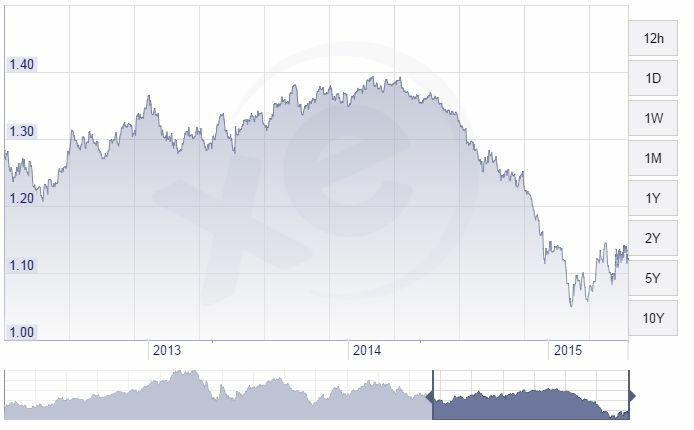 That's a 19% decline and despite the recent upswing, I don't think all troubles are over. As with price fluctuation I think I shouldn't worry too much about this and let Mr. Market do his job. 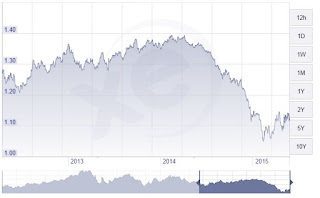 If you look at it from an optimistic view you could say it's good I'm invested in US companies instead of EU companies with this strong dollar, right? What are your thoughts on this? Multiple broker accounts to decrease risk? Next, theres some concern about my broker. I'm with the cheapest broker in The Netherlands. It has been operational for about 3 years now. The fees are really low. Probably around $1 for a $1000 purchase. Explaining their entire earnings model would be something we could discuss in a seperate post, but for now I'm starting to feel a little bit anxious adding more than the current $15k to the account. Do you trust your broker with all your (investing) money? Although I do want to write more than 31 posts during this next year, it takes a lot of effort to write posts like these. And even then, I'm pretty sure these posts are full with textual errors. Please ignore them or write me a message to correct me, especially if you see multiple occurrences of the same error. I won't be offended. Recently, many investors picked up some shares of OHI. Although this should not mean you should buy it as well, it did trigger me to dig some deeper. Omega Healthcare Investors is a Real Estate Investment Trust, a REIT. While reading DGI blogs I have seen the term REIT regularly, but I had no idea what it was. The only things I knew were: high yield, high payout ratio and pretty risky if you compare it to regular Dividend Aristocrats which produce tangable products, like MCD, JNJ & KO. Fortunately I came across the official website about REITs, www.reit.com. They provided a very solid, basic explanation. If you're not familiar with REITs, I suggest you read this website carefully. After reading that, I concluded REITs could be a great addition to my portfolio, but I don't want too many of them. It is very good for diversification though. So, let's get into the interesting parameters of this REIT. The attrictiveness of the stock was immediately clear when I took a look at the amazing 6.00% yield. They usually raise their dividends every quarter and they have been doing so for the last 11 quarters. With several raises per year, the snowball grows even faster! Talking about growth, their DGR numbers are looking very good as well. The DGR-3 is 9.2% and the DGR-5 is even at 11.0%. Those are fantastic numbers if you combine them with the high yield. Because REITs usually have a huge amount of depreciation on their statement, metrics like P/E and EPS are not very useful. Instead, we determine the valuation of a REIT by their price per funds from operations, or P/FFO. The lower the better. The P/FFO of OHI is 12.45, which is a very attractive value. 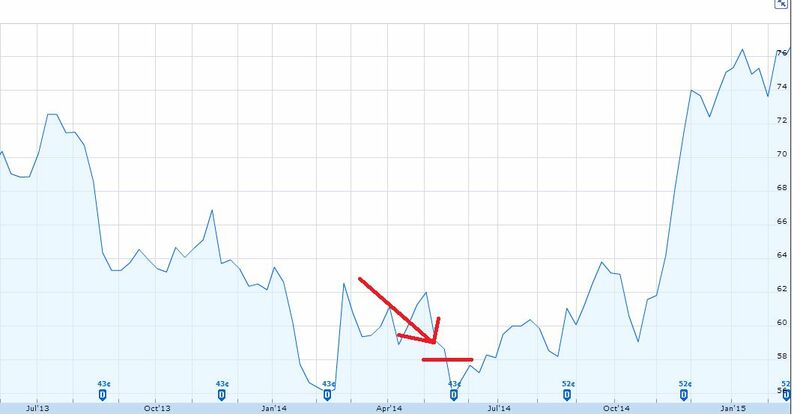 Last, the stock value took a hit over the last couple of months. The decline from the 52-week high value of $45.46 (which occurred in January) down to my entry point of $35.49 is roughly 22%. As you probably know, price is just a number, but this is another valid reason for current shareholders to average down. 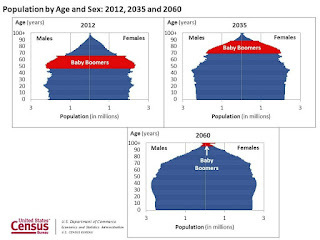 Looking forward I think there is a lot of potential growth for the Healthcare sector. Technically REITs are financial products, but as OHI invests in Healthcare facilities I think their profit highly depends on that sector as well.